K.A. Linde does it again. 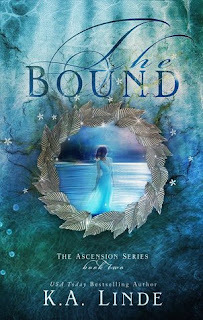 I am continually blown away by the Ascension Series. The Bound is amazing. My favorite book so far and I am not a YA fantasy reader at all. This is an amazing read.I seriously need book 3 now!! I know I said that about The Affiliate but in all honesty The Bound blows The Affiliate out of the water. I would recommend a reread of book one, or at least a look at your notes prior to going into The Bound, because everything means something with this series and you need to be able to recall information from The Affiliate. Once you start reading you aren’t going to want to stop. These characters are so fun and charismatic. They never do what you expect them to do, they are frustratingly fun! New characters are introduced (those vision she saw in book 1 are important), trust is tested, love is declared and evil lurks around every corner. This world that Kyla has created is so detailed and amazing that you'll want to stay there forever! This is a series that you will want to read slow and enjoy it, so make sure you allow enough time. Thanks for review Terri, I hate waiting for the different books, so hopefully won't have to wait too long for book 3!